You know, I have my moments when I’m just plain hungry. I want something quick and it also has to be filling. Pasta really is my go-to for this type of feeling. Here’s why: while the pasta is cooking, the sauce should be simmering too. Then, you can just combine a sauce with cooked pasta and then dinner is served. It’s still Summertime, technically. I’m stuck on this summer kick. So, it’s lemon everything…until September gets here – lol. What goes great with lemon? Seafood! 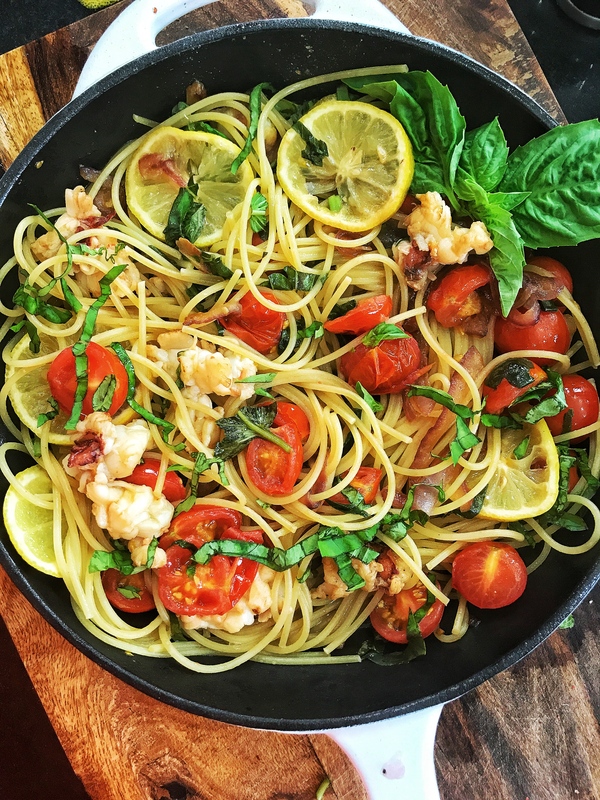 Lobster cooks up quick, is flavorful, and goes great with the sour of lemon, the savory of basil, and the acidity of tomatoes. It’s a complete win in my book. Enjoy the recipe. 1..In a large skillet, saute the garlic tomatoes and red onion in the oil and butter until fragrant. Do this over medium heat. It should take about 2-3 minutes. 2. Then, season the butter and oil mixture with salt, pepper, white pepper, garlic powder, chili flakes, and dried basil. Combine well and cook for about 60 seconds. 3. Then, add in the lobster and cook just until it’s cooked through. Finish the dish by adding in the lemon slices, lemon juice, and a handful of fresh basil that’s been chopped thinly. 4. Add in the pasta and toss to coat well. Enjoy while it’s still warm. *If you’re a salt addict like me, you might wanna finish up the dish with a sprinkle of flaky sea salt. But, if you’re watching your sodium intake, then omit this part. Made the caramel cake and made me reminisce about my aunt who died with her recipe… so glad to have tasted it again. Added pecans to the pan before putting in the batter and boy o boy! !